I previously shared a post about my favorite tape measure, the lefty-righty. I’ve recently discovered a new favorite, the Flatback measuring tape. I consider this another “must have” woodworking and cabinet making tool. I still love my lefty-righty and use it a TON but I use it more for remodeling and measuring long boards and moulding. Things the flatback can’t easily do. So they’re really both essential tools. The flatback measuring tape is exactly what it sounds like it should be — a flat tape measure. I purchased a one with both imperial and metric measurements, but they are available in many other formats as well. The reason I looked into finding something better, is because traditional tape measures have a curve in them. This helps keeps them rigid so you can extend the tape and measure long distances without holding both ends. That is a necessary feature for remodeling and sometimes marking cut locations on long boards. 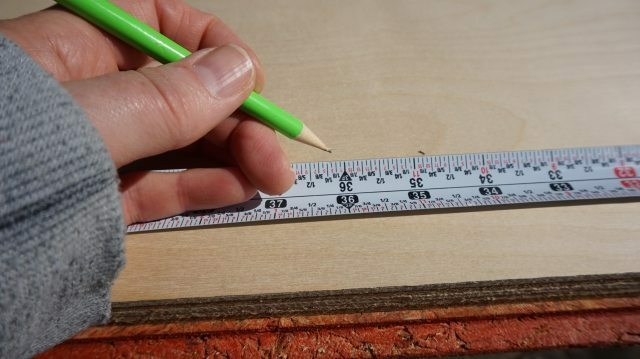 However, it can be difficult to get precise markings down to 1/16″ because part of your focus is in pushing the tape flat against the wood so you can mark the wood exactly where the little tick mark is. The Flatback lays completely flat on the surface you are measuring making it a breeze to see the exact tick mark you want to hit. It is also completely limp, almost like a fabric tape measure. You have to place the hook on the edge of the wood and walk the tape out along the wood to the length you want. 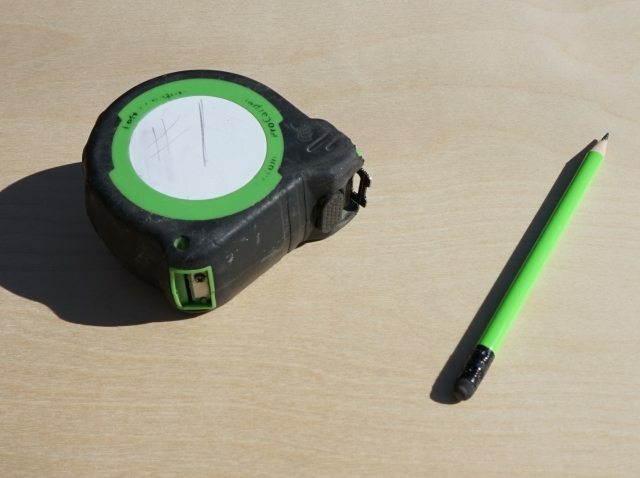 The Flatback tape measure also has an erasable notepad and built-in pencil sharpener. Same as the Lefty-Righty that I love! There’s something about the simplicity of the tool that makes me immensely happy. It is a completely basic tool. Yet, with a simple modification it makes the task of precise measuring so much easier. Awesome! I had no idea these existed! Gotta get one this weekend. I’ve been using the same 2 tape measures for several years. They’re both great! Thanks for the post. When a group of like minded organization-men and women interact to pool area their knowledge and intuit, they disclose and contemplate new feasible business opportunities or tactics in which wonderful gains might be expected coming from all. The synergy of information from organization marketing backlinking numerous career fields of expert knowledge shows options that will not be quickly apparent to a person skilled within the individual industry. So that you can succeed along with your purchases, you must know the way to think all by yourself. The very best investors have the capability to go from the masses. Will not count on other people’s guidance. Because the group is usually improper, it is quite successful to travel from them. It is additionally essential that you are able and also hardwearing . awesome when other people are shedding their’s. As a result, you can aid ensure income to suit your needs. A few weeks prior to the child arrives start off making some extra dishes, or increase or triple your tasty recipes and freeze out the additional. As soon as the child is available so you are adapting to your brand-new routine it will likely be nice to obtain those prepared-created food that you can just burst from the oven. To offer the hair the appearance of increased amount and thickness, consider shading it. Locks coloration plumps the shaft for each strand of your hair, which might aid it to look heavier than it really is. Highlights will also help to camouflage hair loss, particularly if the colour fairly matches that of your scalp.